Apparently whenever Hoffman leaves his house neo-Nazis and fascists appear out of nowhere, despite his best efforts to be rid of them! As people will know I have tried to defend Jonathan Hoffman, the former Vice-Chair of the Zionist Federation until he was elbowed out. Almost a decade ago I wrote to the Jewish Chronicle in his defence. However Jonathan has always had great difficulties with the truth, or more precisely telling the difference between fact and fiction. 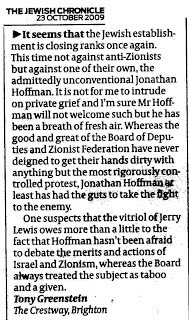 The days when I had to defend Hoffman in the pages of the Jewish Chronicle! In an article Smearing campaigners against antisemitism ……… Hoffman protested bitterly at how he has been smeared and abused. In particular he directed his venom against one Shaun Lawson. Shaun has written a comprehensive article on the weaponisation of anti-Semitism. I copy below the salient parts concerning Hoffman but it is well worth reading in its entirety for its take down of Stephen Pollard, the far-right editor of the Jewish Chronicle, David Collier and the empty headed bucket of venom otherwise known as Rachel Riley. The article, parts of which I don’t agree with, is heavy on content and light on comment. Shaun describes himself as a liberal Zionist. He is no anti-Zionist although anything to the Left of Netanyahu is likely to arouse Hoffman’s ire. Collier is a far-Right Zionist who poses as an independent researcher. He took part in a debate with Melanie Phillips and Dr Brian, Tommy Robinson’s main supporter in Israel. In his speech, Collier explained that there are no Palestinian refugees. He couldn’t even bring himself to refer to them as human beings, preferring to use the pronoun ‘it’. Clearly my numerous articles on Hoffman has begun to grate. He writes that ‘A common accusation made against me is that my political views are far right.’ before referring to a 12 year old article when he opposed David Irving speaking at the Oxford Union. ‘In truth my record of fighting far-right racism is pretty good and goes back many years – see this link from 2007’. It is true, twelve years ago Hoffman opposed Irving speaking (although he also supported banning the Jewish Norman Finkelstein. 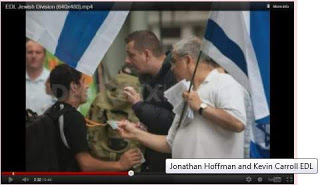 Jonathan Hoffman with Kevin Carroll of the EDL - remember this is a smear! Twelve years is a long time in politics. Hoffman complains that ‘The most frequent smear is that I am associated with the EDL.’ It is indeed a terrible accusation, to be associated with this organisation. The question is whether it is true or not? In 2010 supporters of the Palestinians picketed an Israeli shop, Ahava, which was selling Dead Sea beauty products in Covent Garden. After about a year the shop closed. Palestinian supporters outnumbered the Zionists and that was why the EDL began turning up, dressed in para military fatigues. The EDL was notorious for flying the Union Jack alongside the Israeli flag at their demonstrations, something which Zionist organisations turned a blind eye to. at one of these demonstrations, a photo was taken of me in the proximity of someone who had been involved with the EDL. On the basis of this one photo I have been repeatedly smeared as an EDL supporter/member/ sympathiser.... I cannot be held responsible for who is in my proximity on the street. If I was photographed in the same frame as Dr Harold Shipman that does not mean I support the murder of the elderly. And you have to agree. The fact that I may bump into someone who turns out to be a fascist or someone with a camera happens to catch me in the same frame as a neo-Nazi doesn’t therefore mean that I’m a neo-Nazi. Hoffie says just because someone catches him with the late Harold Shipman doesn’t mean that he wants to kill off the elderly. As Hoffie so rightly says ‘Most of the people who have smeared me have... been anonymous. An exception is Tony Greenstein’ but Tony Greenstein ‘now generally discredited’ and what is worse expelled from the Labour Party so that what I have to say can be disregarded! Not only has the discredited Tony Greenstein smeared Hoffie but other people have smeared him suggesting ‘that I turn a blind eye to atrocities in Judea/Samaria’. This isn’t true and Hoffman digs out a single article condemning settler price tag attacks to prove it. Of course this is somewhat disingenuous. Hoffman is a committed supporter of the settlements which are established on confiscated Palestinian land. This particular arson was condemned by the army, which protects the settlers, and the Defence Minister Ehud Barak. We would look in vain for any condemnation of the demolition of Palestinian villages on the West Bank or even the demolition of villages in the Negev to make way for Jewish towns. One would look in vain for Hoffman’s criticism of the endemic racism against Israeli Palestinians. It would be futile to expect Hoffman to condemn the murder of unarmed demonstrators in Gaza this past year. It is no accident that in order to provide ‘proof’ that he condemns what he calls ‘atrocities’ he has to go back a decade. 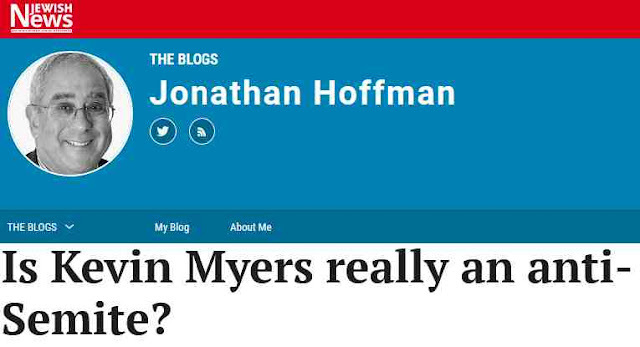 Hoffman finishes his blog by assuring his readers that ‘This blog is published not in my own interest – the smears are like water off a duck’s back.’ Naturally Hoffman wasn’t concerned about the attacks and criticism of him because that is ‘water off a duck’s back’ (strangely enough the comparison between Hoffie and a duck seems entirely appropriate!). He is only writing it to protect the reputations of other people who have been subject to guilt-by-association. Clearly Shaun’s article caused Hoffman extreme distress, because the previous week he had also devoted a blog to his criticisms. Hoffie tries to write off Shaun’s article by stating that it is ‘a cut and paste job from work by expelled Labour member Greenstein and others’. Would that this were true. Shaun nicely complements the stuff I have written but there is plenty of fresh meat in what he writes (Hoffie’s graphic is a picture of a sheep being shorn (if you get the pun!). The definition was drafted to make it easier for data collectors to know what to put in their reports and what to reject. It focused their attention away from the question of whether the actor hated Jews, and focused them on whether the actor selected Jews to be victims. In other words if Jews were attacked because of the actions of Israel then that is anti-Semitic. I agree. An “Israel Apartheid Week” event was cancelled as violating the definition. A Holocaust survivor was required to change the title of a campus talk, and the university mandated it be recorded, after an Israeli diplomat complained that the title violated the definition. Perhaps most egregious, an off-campus group citing the definition called on a university to conduct an inquiry of a professor (who received her PhD from Columbia) for antisemitism, based on an article she had written years before. The university then conducted the inquiry. And while it ultimately found no basis to discipline the professor, the exercise itself was chilling and McCarthy-like. The reference to an ‘off campus group’ is to the Campaign Against Anti-Semitism. whoppers is the assertion that a Jewish Policy Research Report in 2017 found more antisemitism on the right than on the left. I blogged about the flawed methodology of this study. As a matter of logic, if the JPR Report found that there was more anti-Semitism on the Right than Left, then it stands to reason, that if there is a whopper it is not Shaun’s, since he is simply reporting what they say, but that of the JPR! As to whether Hoffman is a better judge of how to conduct a survey than the JPR I will leave to others. ‘Within a few days Bibi clarified his earlier remarks.’ However Netanyahu’s comments were quite clear, even if he was forced to ‘clarify’ them a few days later. This caused an outrage because it quite clearly did absolve Hitler and put the blame for the Final Solution on the Mufti of Jerusalem. Historically it was nonsense as I showed in an article I wrote. The ‘fourth whopper is the assertion that Israel’s Nation State law is ‘openly racist’’. I think that has now been dispelled by Netanyahu’s statement last weekend that Israel is a state ‘only of the Jewish people.’ Or maybe Hoffie doesn’t consider that racist?! Hoffman returns to ‘that photo of me in the street in the proximity of the alleged EDL activist was dismissed as meaningless more than eight years ago, here.’ Where is here? Why the far-Right, cold war, anti-communist conspiratorial Harry’s Place! Not convincing proof! And the final section of Hoffie’s blog is dedicated to Hajo Meyer, the anti-Zionist Auschwitz survivor. Apparently Hajo ‘was a despicable anti-Semite’. Why? Well here you get the full measure of the bankruptcy of Hoffman’s intellect. Judaism and Zionism are completely different. Colonialism is one of the main tenets of Zionism, they call the Palestinians ‘cockroaches’. Each of these could be quite simply proven. For example Balfour didn’t want the Jewish refugees from the 1903 Kishinev pogrom to come to Britain. That is a fact. He was an anti-Semite, fact. In 1905 he introduced as Prime Minister the Aliens Act which was aimed at preventing Jewish immigration from Czarist Russia. Only in Hoffie’s fetid mind can that not be anti-Semitic. The statement that Judaism and Zionism are different is a position held by most of the Orthodox, in particular the Haredi. Even were that statement wrong it isn’t anti-Semitic. 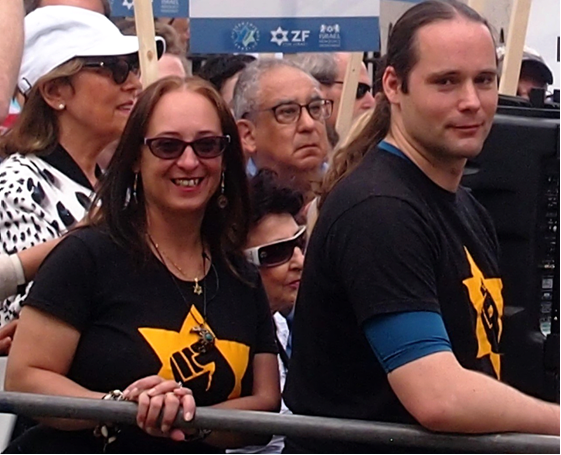 Jonathan Hoffman protesting against Palestine Expo 2017 with Paul Besser of Britain First (with Gemma Sheridan of the JDL in between). Wherever Hoffie goes fascists seem to want to be seen in his company! However I wanted to take up Hoffman’s central defence. He was caught by accident next to fascists. This simply does not hold water. 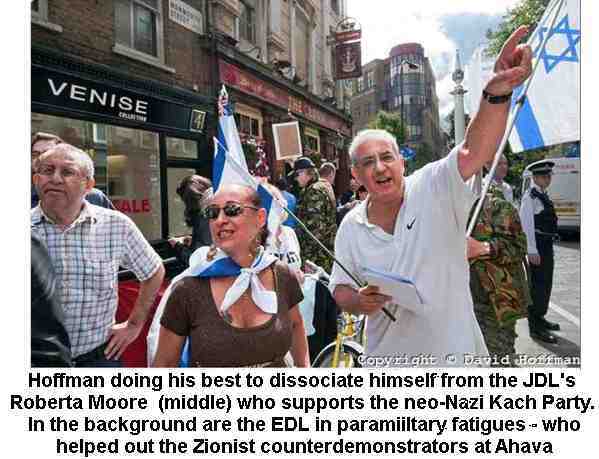 i. Hoffie was dancing down the street with Roberta Moore of the Jewish Defence League. In the background can quite clearly be seen the EDL in paramilitary fatigues. ii. 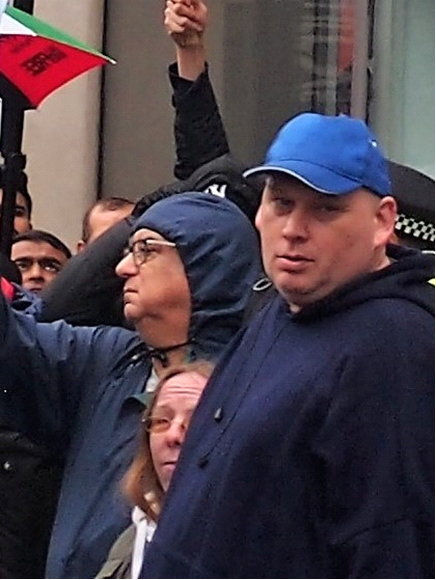 Hoffman has repeatedly been photographed in the company of Paul Besser of Britain First and other supporters of Tommy Robinson. iii. He was photographed consulting with Kevin Carroll of the EDL. iv. He is in the same Facebook group as Besser and regularly works with him as he does with other Zionist supporters of Tommy Robinson. The link that Hoffie directs us to is an article on Harry’s Place. In it there is an email from Inspector Martin Edwards to Hoffie explaining that he could not have a separate pen from the EDL. The only problem is that this email is dated 25th October 2010 whereas the photo of Hoffman in the company of fascists, which he originally described as ‘photoshopped’ is dated 14th August 2010. In other words over 2 months before. For over 2 months Hoffman had no qualms about demonstrating with the EDL and it was only because we pointed out his relationship with the fascists that eventually Hoffie was forced to approach the Police. One final point. Hoffman is, like many Zionists, prepared to go that extra mile to exonerate genuine anti-Semites as long as they are pro-Israel. For example Pollard did this when he wrote in 2009 about the leader of Poland’s Law & Justice Party, Michal Kaminski that Poland's Kaminski is not an antisemite: he's a friend to Jews. He stated that ‘Kaminski is – as his record in Brussels shows clearly – one of the greatest friends to the Jews in a town where antisemitism and a visceral loathing of Israel are rife.’ Support for Israel negated the fact that Kaminski had been a neo-Nazi and had whitewashed the 1941 murder of up to 1600 Jews in Jedwabne by their fellow Polish citizens. As Jonathan Freedland wrote: ‘Once no self-respecting politician would have gone near people such as Kaminski’. Jonathan Hoffman's Lies Catch Up With Him 29.8.10. Union of Jewish Students Attack on Jonathan Hoffman 7.11.11. Setting the EDL Cat Among the Zionist Pigeons 25.10.10. 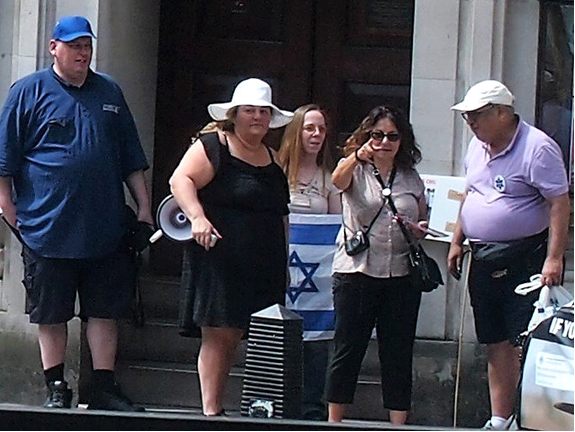 Jonathan Hoffman of the Zionist Federation and the EDL’s Roberta Moore Hold a Joint Demonstration 14.8.10. Probably Collier’s most notorious friend is one Jonathan Hoffman, ultra-Zionist extraordinaire. Hoffman’s speciality is intimidating pro-Palestinian activists; even Holocaust survivors. You will, I’m sure, recall the furore surrounding both Corbyn’s co-hosting of a meeting in Parliament on Holocaust Memorial Day 2010, entitled ‘Never Again — For Anyone’; and his referral to certain Zionists as “not understand[ing] English irony”. There is a direct link between the two. At the former, the late Holocaust survivor, Hajo Meyer, appeared to liken the Israeli government’s treatment of the Palestinians to the Nazis’ treatment of the Jews. Not, please note, in the death camps — which would be absurd and grotesquely offensive — but during the 1930s. Controversial, certainly; hurtful to many, I’ve no doubt. But while it’s not something I agree with, it’s also not an analogy entirely without merit, given the open air prison camp, some of the worst conditions on the planet, in which the Palestinian people are held stateless, helpless, voiceless; killed, maimed, tortured and brutalised, while the rest of the world does nothing. Hoffman was among a tiny group of ultra-Zionist hecklers who turned the event into a fiasco. Whenever any other genocide victim tried to speak of their experiences, the hecklers bellowed “Boring!” One heckler made a Nazi salute and shouted “Sieg Heil!” at Meyer, a Holocaust survivor. Hoffman continued to disparage Meyer as “the amazing dancing bear” until his death in 2014. After all, what’s one heroic survivor’s immense suffering and unimaginable experiences when set against another man’s bigotry and hate? Predictably enough, none of this background was mentioned when the media went to town on Corbyn back in the summer. Yet it is precisely these thugs to whom Corbyn was referring in his ‘English irony’ comment. He’s a long-suffering veteran of how they behave. ‘Zionists’ meant only these few individuals. So when the media went ballistic and demanded answers from Corbyn, they took the side, unwittingly or otherwise, of fascists and hooligans against a deceased Holocaust survivor. That is how far through the looking glass we now are; and all those who did so, including a vast array of journalists who hail themselves as voices of reason, should be ashamed. Both Collier and Hoffman hold a veritable smorgasbord of ridiculous, offensive, racist opinions. At a discussion where he sat alongside Melanie Phillips in 2016, Collier declared that “the Palestinian refugee was forged as a weapon. It was created as an artificial entity”. Note here how in Collier’s language, Palestinian refugees are dehumanised as ‘it’. His views would certainly be news to the more than five million displaced Palestinians worldwide. Hoffman does precisely the same. He doesn’t even accept the Palestinian people, as we understand the term now, existed before Israel’s creation; but whereas Collier does at least engage in calm, cordial discussion, Hoffman is simply unhinged. 8. Frequency of synagogue attendance”. 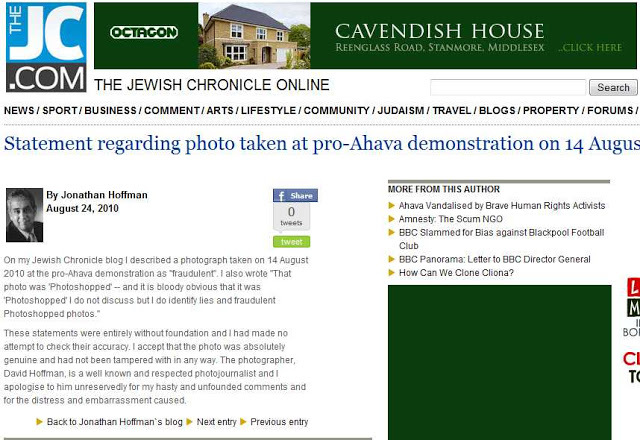 That Hoffman had, it was helpfully pointed out, been posting on his blog on Shabbat (!) was, presumably, why he took this gibberish down. Both Collier and Hoffman are, in different ways, utterly ridiculous figures who, in any sane universe, would be ignored. As British politics are about as far removed from sane as it’s possible to conceive of, they’re not; especially not in Collier (or is it Gnasher? )’s case. Both individuals are part of something I’ve noted with growing alarm in recent years. Paralleling what’s happened to the Israeli left over the past couple of decades, there is an ongoing effort to silence liberal Jews like myself and countless others. To make us seem like ‘self-hating Jews’; or worse, apologists for antisemitism, despite having fought it all our lives. In that sense, a rather brilliant trap has been laid for the Labour Party. The media smears Corbyn and his supporters as ‘anti-Semites’. It doesn’t matter if it doesn’t provide proper evidence; only the smear counts. Because it means that if anyone challenges it — if anyone calls out the idea of ‘endemic antisemitism on the left’ as the offensive nonsense, disproved by research, it undoubtedly is — they will be denounced as either enabling antisemitism or an anti-Semite themselves. Sadly, using antisemitism as a trap is nothing new. As the late former Israeli Education Minister, Shulamit Aloni, who would undoubtedly be condemned as an anti-Semite under the IHRA examples, courageously acknowledged in 2002. When Holocaust survivors like Meyer are smeared; when the media ignores antisemitism on the right, sensationalises any it might find or, more often, allege on the left (instead of reporting both soberly and with equal importance), and when racists such as Collier or GnasherJew become ‘respected voices’, we can say with confidence that something none too dissimilar is going on in the UK now. And when the most prominent newspaper of the British Jewish community, the JC, should be doing its utmost to bring people together, it fans the flames instead. Between them, Collier, Hoffman, Pollard and others are all playing the same cynical beyond belief game. And so, for that matter, is someone else. Is the problem antisemitism? Or anti-Zionism? There is, though, one thing I want to re-emphasise. When I state, with categorical conviction (and, I would argue, proof) that the question of antisemitism on the left has been blown up out of all proportion, I am certainly not saying it doesn’t exist. When I state, with equal conviction, that many of those cited as proof of the extent of the problem were either bots, or internet troublemakers and trolls with precisely nothing to do with either Corbyn or the Labour Party, I am not saying that antisemitism in Labour doesn’t exist. There have been a few hundred cases in a membership of about 550,000: less than 0.1%. Those cases must be dealt with through speed and urgency. A personal view is there’s been a tendency to overlook antisemitism from all sections of society at times because, for want of a better phrase, most of us Jews ‘blend in’. The problem is how so many of us, unconsciously or otherwise, feel we have to. The difference in how members of the public might respond to liberal Jews like me going about our daily business, compared with orthodox Jews who identify themselves as Jewish through their clothing, must surely be significant. If so, that is awful, and something for everyone to reflect on. And while there isn’t, contrary to popular belief, a serious problem with antisemitism on the left, it is certainly the case that anti-Zionism is infinitely more prevalent than on the right. Which is precisely why Labour focus on it in their Code of Conduct; but also, unhappily, why the likes of Collier, Hoffman or Bennun seek to conflate it with antisemitism. Without question, the language used against Israel is frequently far too strong; and the entire Israeli people being held responsible for the actions of their wretched government also occurs too often, and is quite outrageous. When Jews, whether in Israel, Britain or anywhere else, are too… well, that is antisemitism, plain and simple.